Home / Featured / Just how bad have Newcastle United been this year? Just how bad have Newcastle United been this year? Jack Colback this week claimed that the table does Newcastle a disservice, “I think we’re in a false position” he said. Sometimes it’s possible to scratch beneath the surface of a team and find that it performs well in some areas but doesn’t have a position that reflects it, sometimes lowly placed teams can be scoring quite a lot of goals, or they can be very tight at the back, some teams lose few but draw too many to climb the table. To get a picture of how Newcastle have fared under each measure, I split the table into each area and ordered the teams on how they fared. Unfortunately, it does not support the view of Jack Colback. 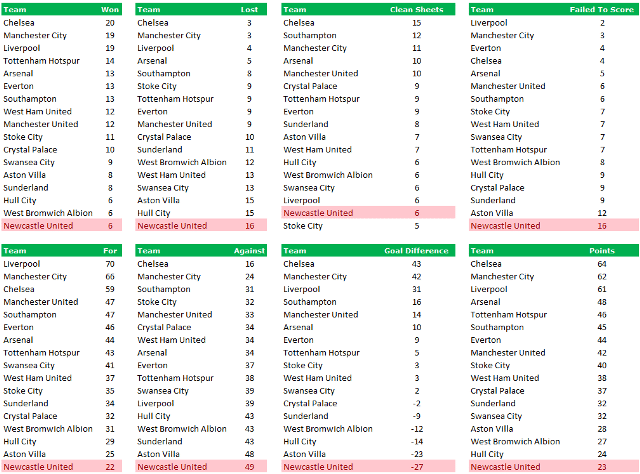 In 2014, all the non-relegated, non-promoted clubs have played 27 Premier League games each, and across those games Newcastle United come bottom in every measure, except clean sheets – where they’re second bottom, having kept one more clean sheet than Stoke. Of greater concern than simply being bottom is the extent to which we’re worse. Won half as many games as West Ham. Lost twice as many games as Southampton. Failed to Score twice as frequently as West Brom. Scored half as many goals as Everton. Goal Difference twice as bad as Hull. Almost half the points of Stoke. These are not the top 6 clubs that we have been told by the club repeatedly that we cannot compete with, despite having the third biggest stadium/crowds, the fifth wealthiest owner, the third highest profits and sixth most expensive tickets. These clubs are supposed to be our mid-table competition, or worse! It’s these facts that counter the PR from those connected to the club so effectively, like Sir John Hall claiming that any animosity to the manager/owner would only do harm. Without any protests they’re doing more than enough harm themselves. Could it get much worse? Of course the biggest protest was a walkout against Cardiff City at the end of last season, a game that ended with a 3-0 win, the most convincing Newcastle win of 2014. Perhaps we need more of that kind of intensity about the stadium.